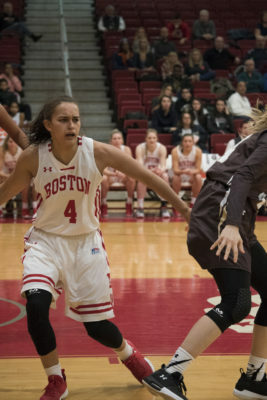 The Boston University women’s basketball team won its second straight game Saturday afternoon in a nail-biter against in-state rival the College of the Holy Cross by the score of 64-58. BU (10-13, 5-8 Patriot League) came into the Turnpike Trophy matchup having recently snapped its six-game losing streak after a win against Colgate University Wednesday night. Meanwhile, Holy Cross (10-14, 5-8 Patriot League) entered the game having lost its previous two games. The Terriers got off to an aggressive start. Junior forward Naiyah Thompson made two quick layups to put her team up 4-0 to begin the contest. The Crusaders relied on the three-point shots for most of the game, but missed seven attempts from beyond the arc in the first quarter and were limited to only 11 points. BU went on a 8-0 run at the end of the quarter to increase its lead to 18-11. Many of these points came in transition. The Terriers finished with 45 rebounds and had 10 fast break points throughout the game, as well as 11 second-chance points. BU continued to gain momentum as the first half went on, shooting 51.7 percent from the field. Sophomore forward Nia Irving continued her dominant season and contributed 13 first-half points of her own. 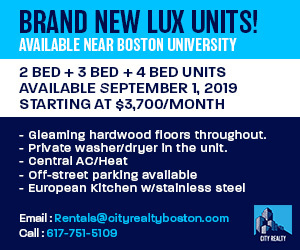 Despite the hot start, BU’s steady offense seemed to unravel a bit in the second half, as 12 turnovers allowed the Crusaders to fight their way back into the game. Holy Cross was led by senior guard Infiniti Thomas-Waheed and is second in the Patriot League with 16.8 points per game. The league’s No. 1 scorer, teammate sophomore forward Lauren Manis, was limited to only five points by the Terriers, which was her lowest scoring performance of the season. BU entered into a bit of a drought in the third, not scoring a single point in the final five minutes of the quarter. As the fourth quarter got underway, what was once a 14-point Terrier advantage was now down to a narrow 44-42 lead. Something similar happened when these two teams faced off earlier in the season. BU had held the lead for much of the game, but was unable to secure the win as the team fell late. This time around, the Terriers were able to hold on for the win and Steding noted her team’s growth and determination. Holy Cross continued to shoot three pointers, making clutch shots from beyond the arc to keep the game close in the final quarter. Thomas-Waheed went 7-for-14 from deep and finished with 31 points. However, Irving’s 10 fourth quarter points kept the Terriers in the game. Free throws from Thompson and junior guard Payton Hauck, as well as a crucial block by senior center Sophie Beaudry against a Manis three-point attempt with five seconds remaining prevented the Crusaders from taking the lead. When the clock wound down, the Terriers emerged victorious by the score of 64-58. With the win, BU jumped up in the standings, and are now tied with five other teams, including Holy Cross, for fourth place. With five games remaining in their schedule, the Terriers will hope to continue gaining some momentum as they take on first-place American University next Wednesday at Case Gym.